A Harvard-trained obstetrician-gynecologist, prominent blogger, and author of the classic How Your Baby Is Born delivers a timely, important, and sure to be headline-making expose that shines a light on the natural parenting movement and the multimillion-dollar industry behind it. The natural parenting movement praises the virtues of birth without medical interference, staunchly advocates breastfeeding for all mothers, and hails attachment parenting. Once the exclusive province of the alternative lifestyle, natural parenting has gone mainstream, becoming a lucrative big business today. But those who do not subscribe to this method are often made to feel as if they are doing their children harm. Dr. Amy Tuteur understands their apprehensions. “Parenting quickly feels synonymous with guilt. And of late, there is no bigger arena for this pervasive guilt than childbirth.” As a medical professional with a long career in obstetrics and gynecology and as the mother of four children, Tuteur is no stranger to the insurmountable pressures and subsequent feelings of blame and self-condemnation that mothers experience during their children’s early years. The natural parenting movement, she contends, is not helping them raise their children better. Instead, it capitalizes on their uncertainty, manipulating parents when they are most vulnerable. 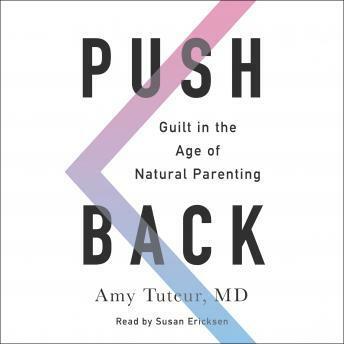 In Push Back, she chronicles the movement’s history from its roots to its modern practices, incorporating her own experiences as a mother and successful OB-GYN with original research on the latest in childbirth science. She also reveals the dangerous and overtly misogynistic motives of some of its proponents—conservative men who sought to limit women’s control and autonomy. As she debunks, one by one, the guilt-inducing myths of natural birth and parenting, Dr. Tuteur empowers women to embrace the method of childbirth that is right for them, while reassuring all parents that the most important thing they can do is love and care for their children.